Imagine calling to the witness stand the paramour of your client’s estranged spouse, in an attempt to prove that the spouse entered into a marital property agreement with a divorce in mind. It sounds like it’s just Hollywood fodder. But it could happen, as a result of a recent decision from the Wisconsin Supreme Court, in which the court held that any marital agreement entered into following the commencement of a divorce action must be approved by a court to be valid. The unanimous decision specifically failed to decide the more difficult situation: where the agreement is reached after the marriage but before a divorce action is filed. 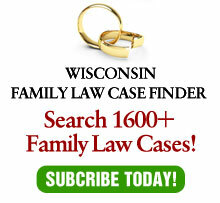 Moreover, the case does not even address whether the presumptions of validity under Wisconsin law are entirely reversed, in terms of equity and practicality. In Van Boxtel v. Van Boxtel, 2001 WI 40, the parties signed an agreement regarding certain parcels of real estate during the pendency of a divorce. Prior to submitting the agreement to the court for approval, the husband repudiated the agreement. The supreme court, citing a court of appeals case, Evenson v. Evenson, 228 Wis. 2d 676, 598 N.W.2d 232 (Ct. App. 1999) as “controlling precedent,” upheld the court of appeals decision allowing Mr. Van Boxtel to do so. The court held that agreements reached in contemplation of divorce must be treated under Wis. Stat. § 767.10(1), which requires the approval of the court, as opposed to agreements reached in contemplation of continuation of the marriage, which are binding on the court under Wis. Stat. § 767.255(3)(L). The decision appears to establish a bright line between prenuptial agreements, where the parties are clearly contemplating marriage, and agreements signed during the pendency of a divorce. However, the court shed no light on the more difficult cases: those where the parties are already married, but not divorce action has been filed. In Ayres v. Ayres, 230 Wis. 2d 431, 602 N.W.2d 132 (Ct. App. 1999), the court of appeals held that such an agreement was made in contemplation of divorce and therefore invalid if not approved by the court. However, the high court in Van Boxtel specifically refused to signal how it might rule on such a situation. As a result, there remains a large gray area for those situations — which are not uncommon — where an agreement is signed after a marriage, but before a divorce has been filed. In cases like in Ayers, where a divorce is filed within a few days, the conclusion that a divorce was contemplated might not be difficult. In other cases, however, the validity of the agreement may very well require state-of-mind evidence, for example, whether one party really was intending the marriage to continue or was engaging in divorce estate planning. Extrinsic evidence, such as the previously mentioned secret romantic partner, might be admissible as evidence of motive or state of mind. In any event, one might question whether a law that binds parties to prenuptial agreements, while permitting them to repudiate agreements made in contemplation of a divorce should be reversed. Prior to marriage, the emotional circumstances of the parties are not conducive to focusing on the financial ramifications of an eventual divorce. Further, as the parties are about to say “until death do we part,” those financial circumstances are very much unknown as a divorce may occur shortly or many years in the future. On the other hand, when a divorce is contemplated, the parties are far more likely to be focusing on the financial consequences of their decisions. Also, the timing of the divorce is much closer, giving the parties a much clearer picture of their financial circumstances. Yet, Wisconsin law presumes the former agreements valid and latter are vitiated. In addition to leaving a wide gap of uncertainty, Wisconsin law may have transposed the two circumstances for which it has given direction.